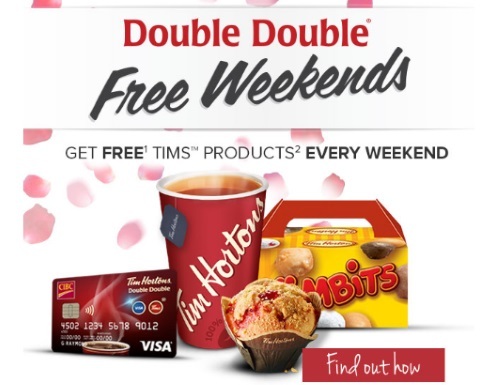 CIBC Tim Hortons Double Double Visa Cardholders will receive a coupon for a Free Tim Hortons product EVERY weekend just for using their card! 1. Use your CIBC Tim Hortons Double Double Visa Card during any of the participating months to qualify. 2. Receive a coupon the following month for a Free Tim Hortons product that you can redeem every weekend. 3. Redeem your coupon on either Saturday or Sunday at any participating Tim Hortons locations and enjoy your Free treat! 4. Your coupon is reusable for the entire month, so make sure you save it on your smartphone or print it and hold onto it. If you accidentally delete your coupon, you can request a replacement. Free items include muffins, medium tea, wedges, box of timbits, and iced drinks (see the chart at the link below for extra details).